It's time to consider the titles eligible for the 2019 CWA International Dagger. Here's the list of translated crime novels published between 1 April 2018 and 31 March 2019 ie the period of eligibility. There's 98* so far (cf 110 last year). *as usual this total includes titles published by AmazonCrossing. I am not sure if these count as UK publications for the CWA Dagger however I imagine people interested in this list will also be interested in these books. In addition to the list I have set up a Good Reads widget on the right-hand side of the blog. This allows the covers to be visible. You can subscribe to this list through RSS. In the list below I've also included the country of birth and gender of the author(s) plus the translator's name and the publisher. The breakdown by gender is 63 Male, 34 Female, 1 Male & Female team. Authors are from 22 countries. The most represented country is Sweden (24) followed by Italy (12) and Germany (10). Today's review is courtesy of CrimeTime's Bob Cornwell. Read more of his reviews on Euro Crime. A Maigret Christmas is being serialised on Radio 4's Book at Bedtime, starting on 24 December. These three first-class Simenon short stories first saw light of day in France in 1951 as a collection titled Un Noël de Maigret. They now return to the Penguin catalogue, newly and ably translated by David Coward, as a Penguin Classic. Then as now, they make an attractive package both for the long-term or intermittent Simenon reader, but also perhaps as a Christmas present for the younger crime reader unfamiliar with his work. Both these stories evolve into complex investigations. 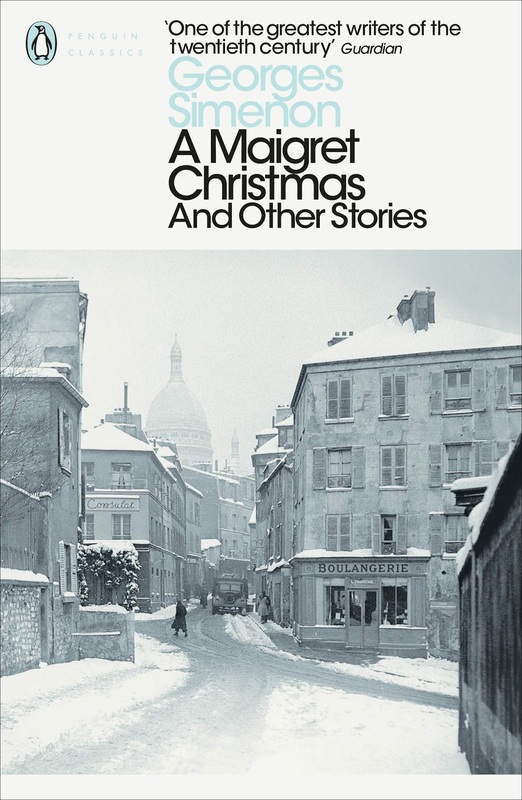 In the first Maigret is soon directing his team of Lucas and Torrence, on Christmas duty in the Quai des Orfèvres, to find the crucial evidence to support his evolving theories. Seven Crosses is even more remarkable. It is also a team effort but it is no less an intimate portrait of Lecoeur, a man fully conscious that, however vital his contribution today “tomorrow he would be just a very ordinary telephone operator sitting at his switchboard”. Simenon’s respect for his humble origins and uncomplaining dedication to his job seeps from every paragraph. Finally, in another milieu close to Simenon’s heart….just as The Little Restaurant near Place des Ternes (“A Christmas Story for Grown-Ups”) is closing after a low-key Christmas Eve, a tragic event occurs. Two female witnesses are questioned: a pretty young woman, “badly made up”, and the somewhat older Jeanne, known to the police as Long Tall Jeanne. Jeanne casually notes from the young woman’s overheard testimony that she comes from the same coastal area as herself, but decides to leave for ‘home’. The night’s events however have left her troubled, so instead she heads for the bright lights of Place des Ternes, with unexpected consequences. A much shorter tale than its two predecessors, it is another beautifully observed, unsentimental tale that nevertheless warms the heart. All three stories are packed with background detail, culled from a lifetime of close observation (Lecoeur’s Paris is “a Paris apart…not the Eiffel Tower, the Opera and the Louvre, but dark administrative buildings with a police van parked underneath a blue lamp, and leaning against its wall, the bicycles of the cycle-mounted police patrols” – and a great deal more besides. Simenon’s “characters grow in this thick soil of sensuous experience…they take colour and conviction from their surroundings”. Thus wrote Julian Symons, crack crime writer and critic in an essay on Simenon in Bloody Murder, his classic study of crime fiction back in 1972. All the more remarkable then that in 1945 Simenon had moved to America and would not return permanently to Europe, apart from two short trips in 1952 and 1954, until 1955. Place du Ternes was written in Tucson, Arizona in 1947, and the other two in Carmel, California in 1950. Great stuff, I think. One for the collection. Here's a snapshot of what I think is published for the first time in December 2018 (and is usually a UK date but occasionally will be a US or Australian date). December and future months (and years) can be found on the Future Releases page. If I've missed anything or got the date wrong, do please leave a comment.